How much does it cost to travel to Dusseldorf? How much money will you need in Dusseldorf? €139 ($156) is the average daily price for traveling in Dusseldorf. The average price of food for one day is €54 ($60). The average price of a hotel for a couple is €148 ($166). Additional pricing is in the table below. These average travel prices have been collected from other travelers to help you plan your own travel budget. How much money do I need for Dusseldorf? Dusseldorf is a city in western Germany divided by the Rhine River, with its Altstadt (Old Town) on the east bank and modern commercial areas to the west. Dusseldorf is a university town and a center of art and fashion. This old electoral capital is also a city of wide streets lined by elegant shops, with a ring of parks and gardens encircling its vibrant downtown area. 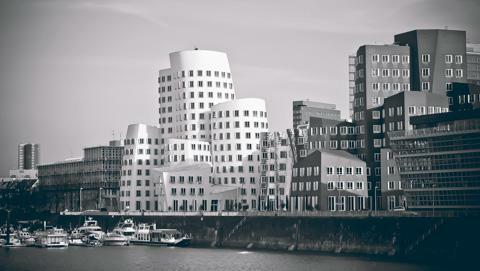 As an important cultural center, Dusseldorf has dozens of museums and in excess of 100 art galleries encompassing everything from internationally renowned facilities, such as the impressive Art Collection North Rhine-Westphalia, to the smaller installations found in the city's trendy Konigsallee area. In the Altstadt, St. Lambertus Church and Schlossturm (Castle Tower) both date to the 13th century. Dusseldorf impresses with boundary-pushing architecture, lively nightlife, and an art scene to rival many higher-profile cities. It's a posh and modern city that likes to have a good time with bar-hopping around the Altstadt, the historical quarter along the Rhine. These tourist attractions, along with the city's location on the Rhine and its numerous wide squares and wonderful riverside walkways, make it a particularly pleasant place to spend time. Dusseldorf's most elegant shopping street is Konigsallee, affectionately known to locals as the "Ko." Comparable to Avenue Montaigne in Paris, this long stretch of high-end real estate was laid out in 1802 and continues to draw the crowds with its eclectic mix of exclusive boutiques, luxury shopping arcades and art galleries, as well as numerous restaurants and cafes. Dusseldorf's Rhine Embankment Promenade offers one of the best ways of enjoying the city's wonderful riverside. Opened in 1997 as a means of hiding one of the city's busiest roads (it's buried beneath the promenade), this long pedestrian route gives the city a distinctly Mediterranean flavor, lined as it is by cafes, restaurants, galleries, and shops on one side, and the mighty Rhine on the other. An easy ten-kilometer journey from the city center by public transit, Schloss Benrath is a splendid Baroque palace constructed between 1756 and 1773. Highlights include the palace's sumptuous interior, as well as a stroll around its huge park and gardens. Originally built for Elector Carl Theodor, the palace is home to three excellent museums focusing on various aspects of life in the 18th century. Dusseldorf's Old Town remains remarkably well preserved and should be included on your list of must-see attractions. The focal point of the Old Town is the Marktplatz where you'll find the imposing Town Hall and a large equestrian statue of Elector John William II erected in 1711. Another highlight is the Castle Tower in Burgplatz on the banks of the Rhine. The only surviving section of this old castle that once dominated the city, the tower is home to the SchiffahrtsMuseum, one of Germany's best (and oldest) marine museums with fascinating exhibits on the history of shipbuilding and trade. Incorporated into the city in 1929, Kaiserswerth is one of Dusseldorf's oldest and most sought after neighborhoods and is a wonderful place to explore Baroque buildings. It enjoys an envious location by the River Rhine and is regarded as one of the most picturesque parts of the city with its beautiful houses and green avenues. Historic churches and architecture, cozy beer gardens and the possibility to embark on a river cruise make Kaiserswerth a great day trip for tourists and locals alike. Named after the river tributary, Dussel that flows through the city, Dusseltal is one of the most sought after locales in Dusseldorf for families. This quiet neighborhood has something for everyonebeautiful nature and playgrounds in the Zoopark, Grafenberger Wald, and Schillerplatz, fashionable shopping, lots of great restaurants and cafes, sports bars, the elegant St. Paul's church built in neoclassicist style, and the exciting Dusselstrand pool, sauna, and aqua play area. Oberkassel is one of the upmarket and expensive neighborhoods in the city. Sprawled on the bank of the River Rhine, this area boasts a beautiful riverside walkway, two churches over 100 years old, amazing architecture, luxury boutiques and some of the most popular restaurants in the city. Sharing its border closely with Oberkassel, Niederkassel is a quiet, peaceful neighborhood that is perfect for families. A large part of Dusseldorf's huge Japanese population lives here. Consequently, a particularly attractive spot in this area is the EKO-Haus der Japanischen Kultur, a beautiful traditional Japanese garden and temple. This area is chosen as home by those who like to be where all the action is. Home to the central station, this is one of the busiest areas of the city. But Stadmitte's real attraction is Dusseldorf's premium and luxury shopping street, Konigsallee, while Schadowstrasse, with its own rows of shops, offers a more affordable range of shopping. Stadtmitte is also the financial district of the city. The best theater of Dusseldorf, Schauspielhaus, is also an extremely popular landmark. The Hafen is the commercial and industrial hub of Dusseldorf. Thanks to its scintillating futuristic architecture gracing the Rhine Harbor, the Hafen is an exciting tourist attraction. With rows of hotels, restaurants and cafes, the buzz of this neighborhood is unbeatable. Home to the Heinrich-Heine-University, Bilk is a preferred neighborhood for young crowds. This charming green locality has several interesting restaurants, cafes and nightclubs, but is also a great spot to soak up some history and culture. The oldest church of Dusseldorf, Alte Bilker Kirche, stands a proud testimony to the changing times alongside the relaxing green oasis of Botanic Gardens. See the city in 360° at the Rheinturm. At 218 meters, the Rheinturm (Rhine Tower) is clearly the city's tallest building and perhaps less obviously, it's also the world's largest digital clock as it lights up to display the time as dusk falls. Amongst the more sophisticated Dusseldorf attractions, by day you can revel in the full-circle views from the dizzyingly high observation deck and by night, dine at the revolving Gunnewig restaurant at the top. Among the more unusual things to do in Dusseldorf is a stroll through a serene Japanese garden. One of Dusseldorf's most popular parks - and at 90 acres, one of its largest - Nordpark is crisscrossed by wide pathways through its spacious lawns and themed gardens, including the lovely Lily Garden. Other Nordpark highlights are its Horse-Tamers statue and the Aquazoo Lobbecke Museum, a great place for kids of all ages thanks to its excellent natural history displays, large aquarium, and insectarium. In addition to all the other things to do in Dusseldorf, each July the city hosts the Largest Fair on the Rhine, a massive week-long funfair attracting more than four million visitors. And in November, the popular Karneval brings parades and colorful costumes. Traditional meals in the region are Rheinischer Sauerbraten (a beef roast and sometimes horse marinated for a few days in vinegar and spices served with gravy and raisins) and Heaven and Earth (Himmel und Ad; black pudding with stewed apples mixed with mashed potatoes). In winter the people like to eat Muscheln Rheinischer Art (Rhenish-style mussels) as well as Reibekuchen (fried potato pancake served with apple sauce). Also a special meal: Dusseldorfer Senfrostbraten (Steaks roasted with Dusseldorf mustard on top). Dusseldorf is known for its strong Dijon-like mustard served in a traditional pot called "Mostertpottche", which was eternalized in a still life by Vincent van Gogh in 1884. The Rhine Metropolis is one of the most diverse areas in terms of culinary diversity. Dusseldorf, with the third largest Japanese community in Europe, not only provides a wide range of culinary cuisine but also has a solid foundation of Authentic Asian food in the city. Along with a broad range of diverse cultural cuisine, Dusseldorf is also home to various Michelin starred restaurants that are world renowned. Dusseldorf Airport, also referred to as Rhein-Ruhr Airport, is located 5 miles from the city Centre and can easily be reached by train or the S-Bahn urban railway. There is a long-distance train station served by regional and national services, which is linked to the airport by the SkyTrain, an automatic people mover. Another station situated under the terminal building carries the S-Bahn line to Dusseldorf Central Station, and to Cologne as well as a few selected night services. After Frankfurt and Munich, Dusseldorf International is Germany's third largest commercial airport. The airport is served by 70 airlines. The city is a major hub in the Deutsche Bahn (DB) railway network. More than 1,000 trains stop in Dusseldorf daily. Dusseldorf Central Station at Konrad-Adenauer-Platz is located in Dusseldorf-Stadtmitte. Several Rhein-Ruhr S-Bahn lines connect Dusseldorf to other cities of Rhine-Ruhr. The light rail system also serves neighboring cities and is partially operated underground. The Central Station and the Airport Station are connected to the national and European high-speed systems, so it is easy to get to and around Dusseldorf using public transit. Dusseldorf is also accessible by car with the densest Autobahn system in the country.